No chemicals or nasty synthetic imitations here. Only the best organic vanilla beans are used before our cold extraction and unique aging process takes place, resulting in a true vanilla aroma and the purest taste imaginable. 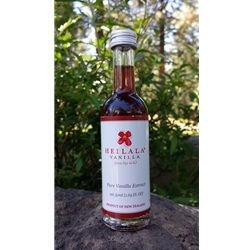 This versatile extract is perfect for all your baking needs or whenever a recipe calls for vanilla extract or essence and really is the icing on the cake in terms of 100% pure vanilla.